Tropical cyclones are the most devastating weather phenomena on this planet. It is a rapidly rotating massive storm system, characterized by a low-pressure center, strong winds, and a spiral arrangement of thunderstorms that produce heavy rain. But cyclones also occur in the Mediterranean basin, although they are rare. Due to the specific dry nature of the Mediterranean region, formation of tropical-like cyclones is infrequent, with only 100 recorded tropical-like storms between 1948 and 2014. That is also the reason that, in contrast to their tropical counterparts, Mediterranean cyclones are not given names. No agency is officially responsible for monitoring the formation and development of these Mediterranean cyclones, which leaves an great opportunity for the Cypriot Department of Meteorology or the Greek Hellenic National Meteorological Service. 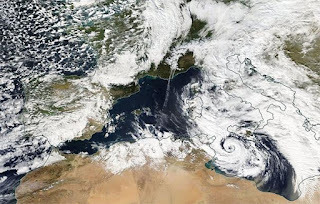 Unlike their tropical counterparts, Mediterranean cyclones require somewhat different factors to form such as sea surface temperatures below 26°C and an influx of colder air to induce the necessary atmospheric instability and a warm and moist air mass. Instability in the Mediterranean is therefore initiated by the coming together of different air masses while in tropical regions instability depends on the rising of an air mass as a result of a warm sea surface. However, the Mediterranean sea is warm when compared to other regions in the world and this helps in fuelling this region’s cyclones through convection. Since the Mediterranean is a dry environment, the required abundant moisture required is often transferred to the region by a low pressure system. Therefore, Mediterranean cyclones often develop from an existing low pressure system. Mediterranean cyclones are generally small in size and may last from just a few hours to not more than a week. Most develop an ‘eye’ for just a few hours and generally feature maximum sustained wind speeds of up to 150 km/h. While small in comparison to tropical cyclones, Mediterranean cyclones can occasionally create havoc. The majority of the Mediterranean cyclones form over two regions. The first encompasses an area of the western Mediterranean bordered by the Balearic Islands, southern France. and the shorelines of Corsica and Sardinia. The second is in the Ionian Sea encompassing the region between Sicily and Greece and as far south as Libya.